Richard Pettypiece was married to Elizabeth (Eliza) Young. They made t heir home in Michigan, U.S.A.. Two daughters were born to them, Prisc illa, the oldest, and Margaret Jane. The circumstances surrounding their arrival in Canada are somewhat unc ertain. Richard may have come to Canada without the family, then retu rned to Michigan to find his wife had died, thus taking the two girl s back to Canada with him. OR Richard's wife may have died in Michigan , and then he decided to move to Canada with the girls. The date of a rrival in Canada is unknown (according to one Sadie Barbour). They settled in Bruce County, Ontario, in Kinloss Township, Consessio n 4, West 1/2 of Lot 34. (They were assigned land on May 11, 1866) I t is unknown as to whether or not he had entered his second marriage a t this time. However, he did marry a second time, to one Sarah Johnst on. Four children were born to this marriage: Sabina, Lavina, Alvina , and Herbert. Richard continued to visit his first wife's relatives in MIchigan, U.S .A. Not in his later years, however. Richard Pettypiece had a brother John Pettypiece. It is possible he a lso had brothers named Robert and James. Robert Pettypiece signed John McBurney's Orange Lodge Certificate in 1 871 (Turnberry Township). This was in Ontario. (KRM has the certifica te). Susan Pettypiece of Ontario married William James (Will) Scharff. 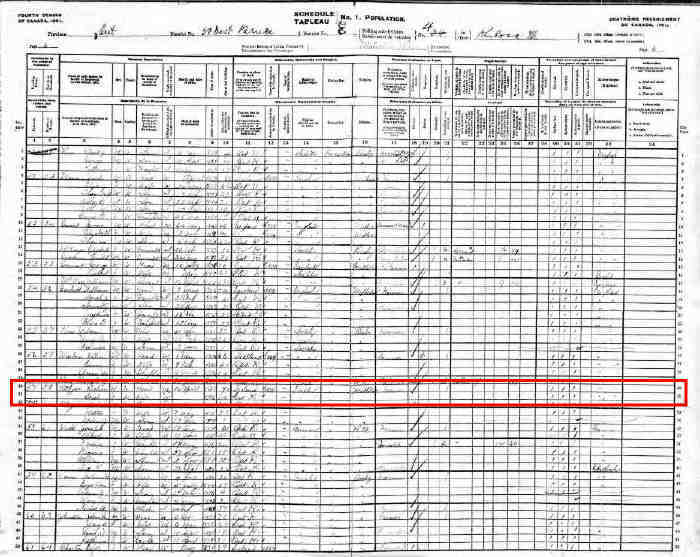 Sh e was born in 1870 and the first child, Elsie, was born in 1897. Thi s puts Susan at age 16-17 when she married. They moved to the Forbe s area in Manitoba in 1903. 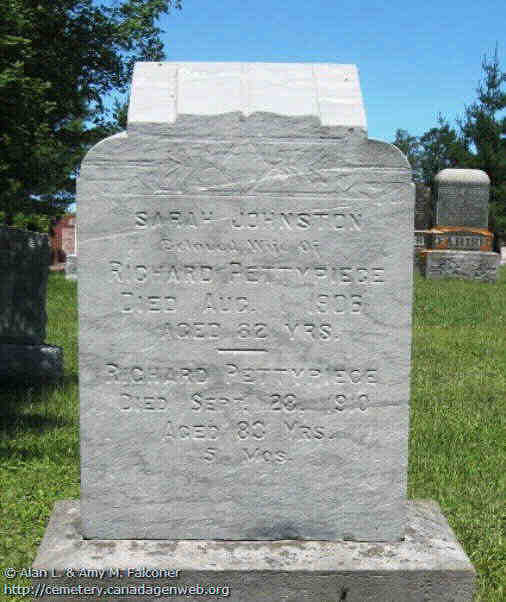 She died in 1921 and is buried in the sam e plot as Robert Pettypiece in Riverside Cemetery, Hartney, Manitoba. 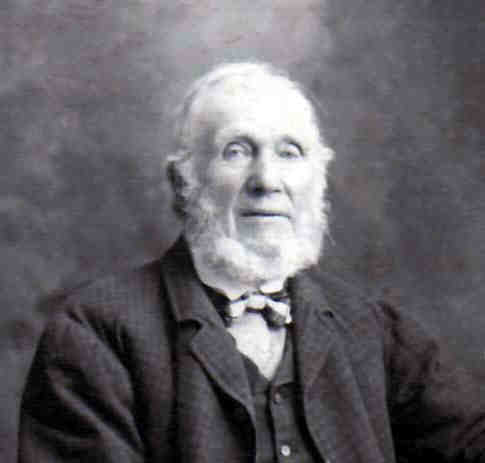 James Pettypiece lived in Culross Township, Bruce County, Ontario. O n June 14, 1869 he received a patent for Con. 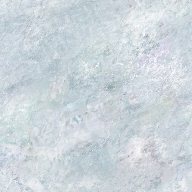 6, Lot 9. He was a crow n deed pioneer and had 58 acres. 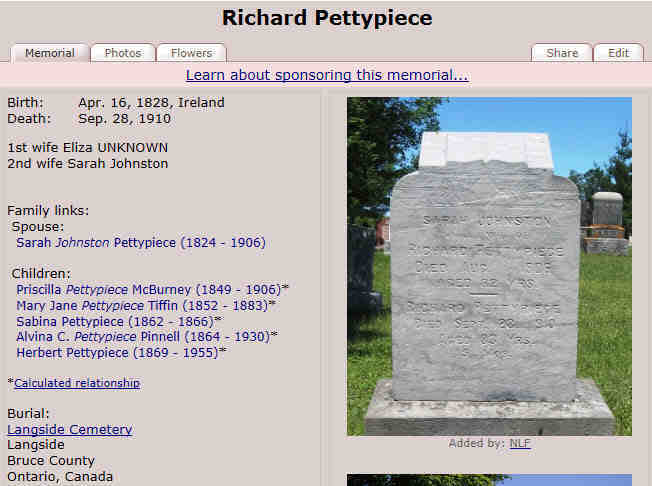 NOTE: The majority of the information on the Richard Pettypiece famil y was provided by Mrs. Sadie Barbour, 45 Alfred St. Apt. 109, Wingham , Ontario and from Bill Tiffin. • Emmigrated: From County Sligo, Ireland to Canada, 1830. 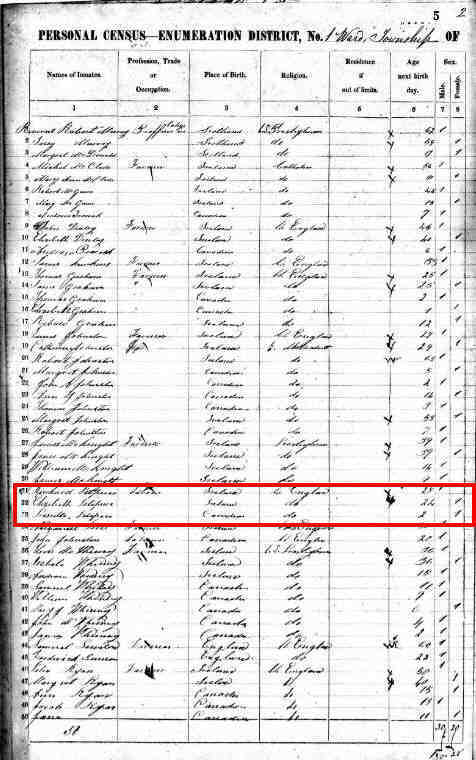 • 1851 Census of Canada: Richard, age 25, with wife Elizabeth, age 24, and daughter Prescilla, 1851. 86 , age 2. Richard, age 25, with wife Elizabeth, age 24, and daughter Priscilla , age 2. 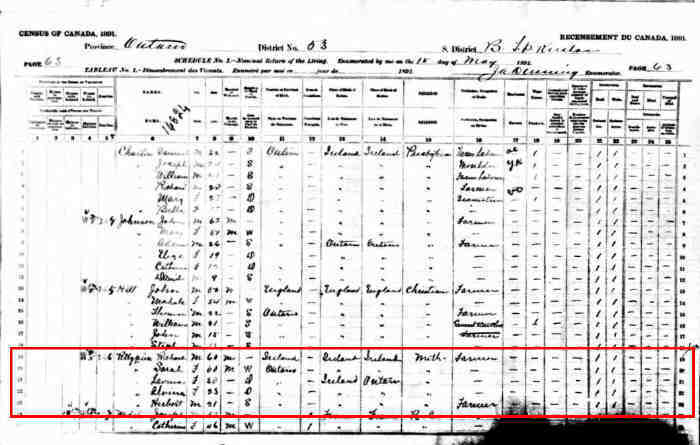 • 1861 Census of Canada: Richard, age 33, with wife Sarah, age 29, and children Prycella, age 1, 1861. 87 1, and Levina, age 2. P. 32, Lines 31 - 34: Richard, age 33, with wife Sarah, age 29, and ch ildren Priscilla, age 11, and Lavina, age 2. Richard, age 60, with wife Sarah, age 60, and children Lavina, age 30 , Alvina, age 23, and Herbert, age 21. Richard, age 72, with wife Sarah, age 74. Also in this household is their son Herbert and his family. 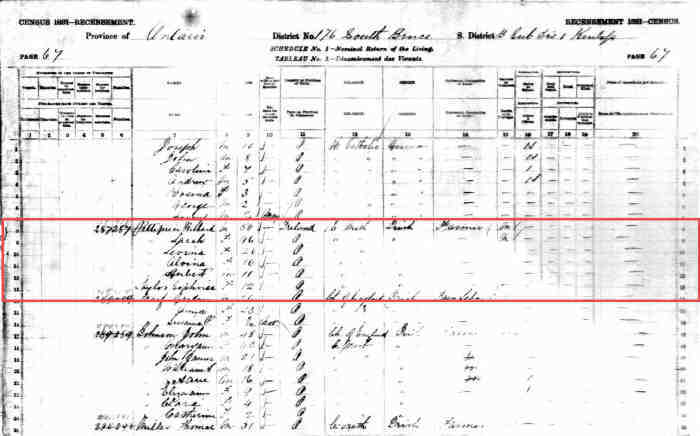 • 1881 Census of Canada: Richard, age 50, with wife Sarah, age 46, and children Levina, age 20, 1881. 312 , Alvina, age 16, and Herbert, age 11, with Sophnia Taylor, age 12. 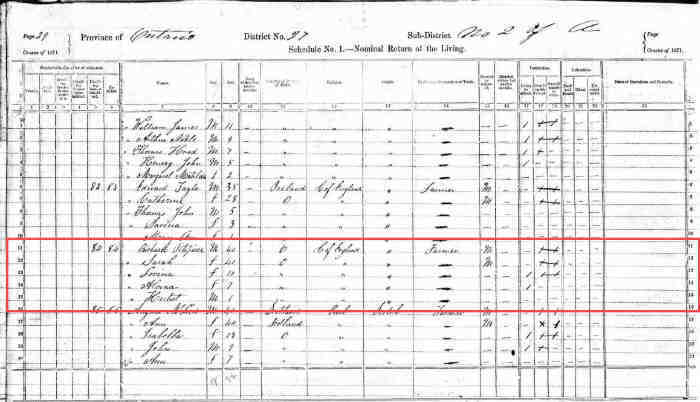 • 1871 Census of Canada: Richard, age 40, with wife Sarah, age 40, and children Lavina, age 10, 1871. 298 , Alvina, age 7, and Herbert, age 1.